UPDATE 9.2.15: The New Canaan Advertiser did their job today and showed up in court to report on Georgia Connick’s arraignment. The State showed it doesn’t treat all New Canaan residents equal though and allowed Georgia to get an off-books delay for October. Meaning the media wasted their time showing up. It also signals an AR deal is on the table. The new court date is October. How nice for Georgia that she didn’t have to slum it hanging out in Norwalk Court like the rest of the New Canaan teens who are charged with illegal underage drinking parties and got to avoid the media. While Harry Connick Jr. has been on tour this summer and prepping for American Idol his 19 year old daughter Georgia Connick has been charged with a Class-A Misdemeanor by New Canaan Police for allegedly permitting minors to illegally posses alcohol in her family’s New Canaan McMansion on 671 West Road. NCPD Lt. Jason Ferraro confirmed on Monday the underage drinking party bust happen at 1am Saturday morning from a party that started Friday night August 14th. Harry and his former Victoria’s Secret supermodel wife, Jill Goodacre, have raised their daughters in New Canaan, Conn. for years and this appears to be the first charge of alleged illegal drinking in their home. Harry comes from a family out of New Orleans whose dad was a district attorney and sister is a military officer. With a law-abiding background like that it’s kind of odd his older daughter Georgia apparently thinks getting drunk is funny. 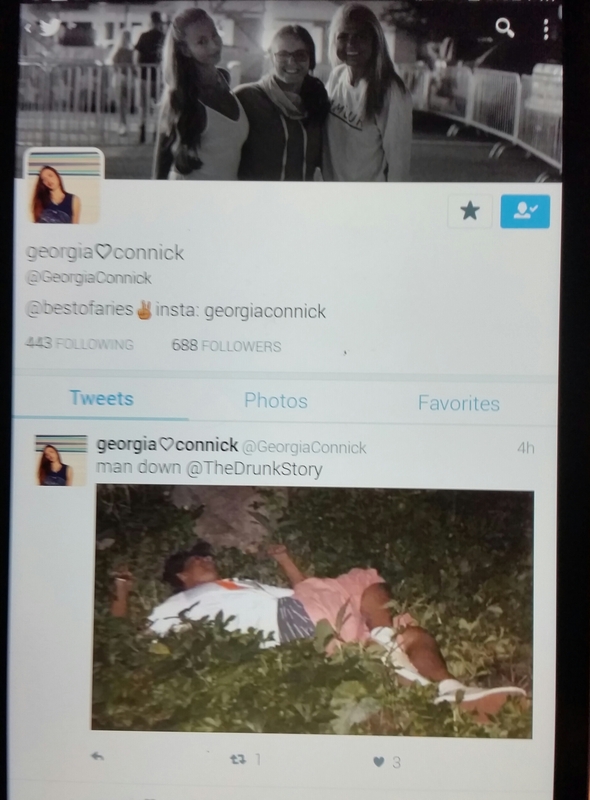 Today she posted this photo of a drunk black man with a link to a site called Drunk Story on her public twitter feed. It’s kind of a miracle the NCPD even brought these alleged charges against a celebrity New Canaan family. When I asked the cop if anyone 15 or younger was at the residence at the time of arrest Officer Ferraro said teens fled from the scene but of the ones caught they have a list of fifteen people who are all 18-20 years old. Georgia was not charged with risk to injury to a minor which could have happen if teens 15 years or younger were in the home or were possibly served. Georgia has younger siblings and it’s not clear if they were home at the time of the party. A class A misdemeanor usually carries less than a year of jail or fine. Georgia could also be facing suspension of her drivers license. Georgia was also issued an infraction charge with a fine between $200-$500 for procuring alcohol for minors. The charge is an infraction the first time but if she does it again it’ll be another misdemeanor. The Connick’s $5.61 million 7 bedroom, 8 bathroom house on 4.61 acres has a cream-colored wood gate that blocks a street view of the house or easy entrance. So I am curious how the NCPD are justifying probable cause to enter the large estate. 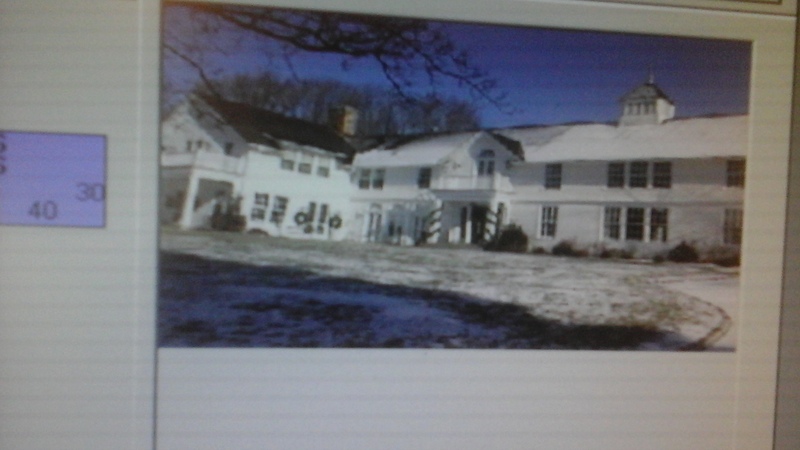 If a neighbor really called about excessive noise late at night( which NCPD claims happen) Connick has GE CEO Jeff Immlet’s family living to the left and Lynn and Richard King to the right who could have outed the teen bash. But NCPD isn’t being transparent with the media about who made the complaint yet. New Canaan Town records of 671 West Rd. Often we see the NCPD force the party host to post at least a $500 bail but they gave the celebrity daughter a hall pass with a promise to appear in Norwalk, Conn court on September 2nd. I was told by a person with a teen at the party that Harry and Jill were not at home. Since 2006 Conn. cops can charge parents for a role in the illegal drinking parties if they can prove the parent knew the teen was going to host an event with drinking or drugs; even if they are not on the premises at the time. Yet it’s rare to see the NCPD follow up or investigate the parents possible role in the illegal parties. Georgia, who attends Tulane University, told the officers on the scene “it started as a small party but then got out of control. I thought I could handle it.” It’s actually really irrelevant how many underage drinkers were there. The letter of the law says if you are under 21 you can’t serve even one of your friends liquor if they are also under 21. And parents can’t allow their teens to host drinking parties. Georgia wasn’t charged with forgery for possessing a fake id to buy the liquor which leaves more unanswered question: did the parents give a nod to supply it, did another minor bring it (why weren’t they charged), or did she raid the liquor cabinet unbeknownst to Harry and Jill. NCPD has this troublesome practice of verbally telling the media events written in their incident reports every Monday morning for news stories in police blotters. (Reports that are a huge page view grab and drive ad fees for local papers.) But when you request to see the incident report to fact check the cops verbal account they deny it. You have to wait till the charged person shows up in court days or weeks later and ask a court clerk for the case. This means reporters can’t really report the whole story in a timely way. I’ve often found the cops leave details out during this verbal media release to either hide the seriousness of the case or promote whatever version of the event they support. It’s a horrible exercise in freedom of information between civic servants and local media, who also often fall down on the job by not trying to get comments from those accused or take a trip to the court house to inspect a case file they have public access to once the cops deliver it. Today officer Ferraro couldn’t even bother to explain to me if the charges are misdemeanors, felonies, or infractions. I had to push the NC PD records women, Frances Danaher, to fact check the charges who first explained it was a Class A Felony charge and then had to call back and explain she was wrong its a misdemeanor. I tried to reach the Connick’s for comment and called Fairfield County defense lawyers who usually rep these kind of cases but have been unable to find if Georgia has a lawyer yet. It will be interesting to watch if the Norwalk assistant states attorney pleads these charges out for the Celeb family or pursues the case. Georgia could be offered something the State loves to easily hand out for wealthy teens in Fairfield County’s Gold Coast called accelerated rehabilitation. This means after a set amount of time if Georgia doesn’t get arrested or caught hosting another drinking party the current charges are wiped off her record like they never happen. UPDATE 8.26.15: Georgia is being represented by Greenwich lawyer Michael Jones of Ivey Barnum & O’Mara. When I reached him for comment he refused to answer questions about the case such as has the States Attorney offered an AR deal yet. Attorney Jones is best know for representing the family of George Smith in his unsolved murder. Her case number is S2ON-CR15-0140602. September 2nd is Georgia’s due date in front of a Norwalk judge to be arraigned. UPDATE 12-26-15: As predicted Georgia was offered an AR deal by the state and accepted it. This means she pleads to the charges but after a year the charges are removed from her public record if she doesn’t get arrested again. The NC Advertiser was able to interview Georgia’s attorney who told the local paper the NCPD were wrong about what she was charged with when they did their media briefs. This is a huge communication mistake by the local cops given there was a large amount of press coverage at nearly every publication that covers the entertainment industry who has now reported inaccurate initial charges. The NC Advertiser reported the charges were nolled. That’s an inaccurate description of how AR works. Nolled charges are dropped charges that a State’s attorney agrees to if there is proof the arresting officers were clearly wrong in asserting the charges on the scene. In Georgia’s case, these are charges accepted by the defendant and the prosecutor and because of Connecticut’s first time offender program they are erased latter from a record but not nolled. There should have been more reporting if Georgia was required or do community service or lost her driving license for a period of time and ordered to pay a fine but the local paper fell down on reporting out this info. Peter Benko – a recent NCHS grad left me this message on my facebook page after this story was published. Peter’s father is Steve Benko, the New Canaan Director of Recreation. I thought the comment was a telling view of how some New Canaan teens perceive illegal underage drinking. And the belief that when people commit illegal acts no one should talk about it or report on it. Hey Teri, I wanted to congratulate you on your wildly successful career in investigative journalism. Clearly your talents are being we disposed of writing articles that expose the personal lives of teenagers. I’m not sure whether maybe you never drank a beer in high school or not but clearly this is a crusade which you refuse to be defeated in. I want to wish you the best of luck while you continue to write articles that thrill stay at home soccer moms everywhere. Considering your essentially a bottom feeder whose career involves teenage gossip you can only go up from here! Sincerely ever single person who reads your ignorant and out of touch “articles”. P.S. Your idea of smash mouth journalism that calls for the punishment of people with bright futures is truly disgusting. Peter sounds very entitled and I have to question what kind of parent raised a young man to speak and think like this. Shame on the Connicks for allowing these kind of parties. At least the NCPD followed the law and made the arrest. Georgia should get the same treatment as any other young adult who broke the law. Just think of all her guest that likely drove home drunk and put others on the road at risk.